Located just a short drive away from Dallas, Mesquite offers its more than 135,000 residents easy access to all of the attractions of an urban metropolis and the pleasures of life in an appealing residential community too. From the Original Town neighborhood to Pasadena Gardens, there are parks and schools within walking distance of nearly every home in this family-friendly city. Texas Fiberglass Pools Inc. keeps swimming pools and spas throughout Mesquite looking their best with quality Mesquite fiberglass pool repair, fiberglass pool resurfacing and an array of additional services. Swimming pools and spas dot the residential landscape, adding to the enjoyment of Mesquite families and homeowners rely on the experts at Texas Fiberglass Pools Inc. to keep them looking stylish and functioning properly. From pool resurfacing to pool maintenance and Mesquitefiberglass pool repair our quality services not only save you thousands of dollars on repairs and replacement, but help you get the most from the time that you spend with your family at home as well. 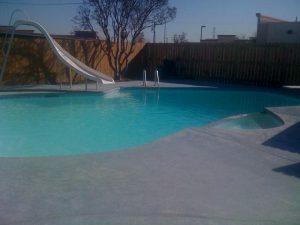 Texas Fiberglass Pools Inc. today for a free consultation or to request a service. Texas Fiberglass Pools Inc. is the leading provider of Mesquite fiberglass pool repair, fiberglass resurfacing for pools, spas, and fountains throughout the Dallas-Fort Worth Metroplex, and we offer an array of other services too. Whether providing pool plumbing maintenance and repairs for family swimming pools or baptistery resurfacing for houses of worship, Mesquite home and business owners turn to our experienced team of pool contractors for savvy solutions. We’ve been serving the region since 1995, and we’ve yet to come across a project that we can’t handle. From deck resurfacing to coping and tile installations, Texas Fiberglass Pools Inc. has earned a reputation for transforming backyards in Mesquite into outdoor spaces for fun and relaxation. Our fiberglass pool resurfacing services are recommended for units constructed of ground gunite, concrete, or block and fiberglass walled with concrete bottoms. People commonly use a vinyl, concrete and paint, or concrete and plaster renovation; but these materials are cheap, require more maintenance, and wear out faster than fiberglass. Fiberglass coated pools are able to handle all the angles; steps, curves, and other features within a pool or hot tub are easily coated by fiberglass. Compared to other resurfacing materials, the fiberglass pool resurfacing that we offer through Texas Fiberglass Pools Inc. will hold up for more years of use and require less maintenance. Plumbing repairs are an unavoidable necessity in any commercial or residential property ownership. We are experts for all your plumbing needs. If you are in need of plumbing maintenance, repair, or a new installation, our pool contractors handle the most complex Mesquite plumbing repair jobs with industry expertise, timeliness, precision, and – most importantly – success. We use only the most trusted and durable parts available on the market for all pool and plumbing repairs, to ensure our jobs are guaranteed to extend the life of your property and prevent problems caused by unreliable materials.